Their Satanic Majesties Request is the sixth British and eighth American studio album by the Rolling Stones, released in December 1967 by Decca Records in the United Kingdom and London Records in the United States. It was the first Rolling Stones album to be released in identical versions in the UK and US. Recording sessions saw the band experimenting widely with a psychedelic sound in the studio, incorporating elements such as unconventional instruments, Mellotron, sound effects, string arrangements, and African rhythms. The album's title is a play on the "Her Britannic Majesty requests and requires ..." text that appears inside a British passport. It is the first Stones album to feature the same track listings in both its UK and US versions. 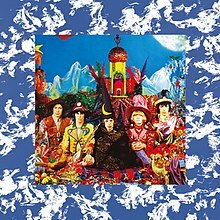 "She's a Rainbow"/"2000 Light Years from Home"
Upon its release, Satanic Majesties received mixed reactions from critics and members of the group itself. The album was criticised as being derivative of the contemporaneous work of the Beatles, particularly their June 1967 release Sgt. Pepper's Lonely Hearts Club Band, with the similarities extending to the LP's lenticular cover. In subsequent decades, however, it has gradually risen in critical reputation. Following the album's release, the Rolling Stones abandoned their psychedelic style for a stripped-down return to their roots in blues music. Mick Jagger disavowed the album in 1995, saying: "[...] it’s not very good. It had interesting things on it, but I don’t think any of the songs are very good. [...] There’s two good songs on it [...] The rest of them are nonsense." Every day at the studio it was a lottery as to who would turn up and what – if any – positive contribution they would make when they did. Keith would arrive with anywhere up to ten people, Brian with another half-a-dozen and it was the same for Mick. They were assorted girlfriends and friends. I hated it! Then again, so did Andrew (Oldham) and just gave up on it. There were times when I wish I could have done, too. There's a lot of rubbish on Satanic Majesties. Just too much time on our hands, too many drugs, no producer to tell us, "Enough already, thank you very much, now can we just get on with this song?" Anyone let loose in the studio will produce stuff like that. There was simply too much hanging around. It's like believing everything you do is great and not having any editing. It's really like sort of got-together chaos. Because we all panicked a little, even as soon as a month before the release date that we had planned, we really hadn't got anything put together. We had all these great things that we'd done, but we couldn't possibly put it out as an album. And so we just got them together, and did a little bit of editing here and there. The working title of the album was Cosmic Christmas. In the hidden coda titled "Cosmic Christmas" (following "Sing This All Together (See What Happens)"), Wyman says in a slowed-down voice: "We wish you a merry Christmas, we wish you a merry Christmas, and a happy New Year!'" Some of the album's songs were also recorded under various working titles, some appearing rather non sequitous and radically different from the final titles. These working titles include: "Acid in the Grass" ("In Another Land"), "I Want People to Know" ("2000 Man"), "Flowers in Your Bonnet" ("She's a Rainbow"), "Fly My Kite" ("The Lantern"), "Toffee Apple" ("2000 Light Years from Home"), and "Surprise Me" ("On with the Show"). In 1998, a bootleg box set of eight CDs with outtakes from the Satanic sessions was released, and it shows the band developing the songs over multiple takes as well as the experimentation that went into the recording of the album. Keith Richards himself has been critical of the album in later years. While he likes some of the songs ("2000 Light Years from Home", "Citadel" and "She's a Rainbow"), he stated, "the album was a load of crap." One proposed cover, a photograph of Jagger naked on a cross, was scrapped by the record company for being "in bad taste". Initial LP and reel-to-reel releases of the album featured a three-dimensional picture of the band on the cover by photographer Michael Cooper. When viewed in a certain way, the lenticular image shows the band members' faces turning towards each other with the exception of Jagger, whose hands appear crossed in front of him. Looking closely on its cover, one can see the faces of each of the four Beatles, reportedly a response to the Beatles' inclusion of a doll wearing a "Welcome the Rolling Stones" sweater on the cover of Sgt. Pepper. Later editions replaced the glued-on three-dimensional image with a photograph, due to high production costs. A limited edition LP version in the 1980s reprinted the original 3D cover design; immediately following the reissue, the master materials for reprinting the 3D cover were intentionally destroyed.[why?] The 3D album cover was featured, although shrunk down, for the Japanese SHM-CD release in 2010. The entire cover design is elaborate, with a dense photo collage filling most of the inside cover (along with a maze) designed by Michael Cooper, and a painting by Tony Meeuwissen on the back cover depicting the four elements (Earth, Water, Fire, and Air). In some editions the blue-and-white wisps on the front cover are used in a red-and-white version on the paper inner sleeve. The inner-cover collage has dozens of images, taken from reproductions of old master paintings (Ingres, Poussin, da Vinci, among others), Indian mandalas and portraits, astronomy (including a large image of the planet Saturn), flowers, world maps, etc. The maze on the inside cover of the UK and US releases cannot be completed: a wall at about a half radius in from the lower left corner means one can never arrive at the goal labeled "It's Here" in the centre of the maze. It was the first of four Stones albums to feature a novelty cover; the others were the zipper on Sticky Fingers (1971), the cut-out faces on Some Girls (1978), and the stickers on Undercover (1983). At some point around 1997 rumors were first heard that the album existed as a promo version including a silk padding. A pink padded version was presented by photo accompanied by a letter from the Decca Copyright Department, but it was shown that the letter does not match the album it was intended to authenticate making it almost entirely certain that this was a forgery. Released in December 1967, Their Satanic Majesties Request reached No. 3 in the UK and No. 2 in the US (easily going gold), but its commercial performance declined rapidly. It was soon viewed as a pretentious, poorly conceived attempt to outdo the Beatles and Sgt. Pepper's Lonely Hearts Club Band (released in June 1967), often explained by drug trials and excesses in contemporary musical fashion, although John Lennon and Paul McCartney did provide backing vocals (uncredited) on "We Love You" (recorded during the Satanic Majesties Request sessions, but released as a single three months before the album). The production, in particular, came in for harsh criticism from Jon Landau in the fifth issue of Rolling Stone, and Jimmy Miller (recommended by the album's engineer, Glyn Johns) was asked to produce the Stones' subsequent albums, on which they would return to the hard driving blues that earned them fame early in their career. In an April 1968 album review, Richard Corliss of the New York Times was also critical of the production value stating "...their imagination seems to have dried up when it comes to some of the arrangements. While still better than their previous ones, the arrangements are often ragged, fashionably monotonous and off-key." Despite this he gave the album an overall positive review, going as far as calling it a better concept album than Of Cabbages and Kings (1967, by Chad & Jeremy), The Beat Goes On (1968, by Vanilla Fudge) and even Sgt. Pepper's Lonely Hearts Club Band (1967, by the Beatles). In a 1970 Rolling Stone interview, Lennon commented on the album: "Satanic Majesties is Pepper. "We Love You"...that's "All You Need Is Love"". The album was released in South Africa and the Philippines as The Stones Are Rolling because of the word "Satanic" in the title. The Wyman-composed "In Another Land" was released as a single, with the artist credit listed as Bill Wyman, rather than the Rolling Stones (the B-Side, "The Lantern", was credited to the Rolling Stones). Most album configurations contain the hidden track "Cosmic Christmas" (running time 0:35) following "Sing This All Together (See What Happens)" (running time 7:58). There are only two songs from the album which the Stones performed live, "2000 Light Years from Home" (1989–90 world tour, 2013 Glastonbury Festival), and "She's a Rainbow" (1997–98 Bridges to Babylon Tour). In August 2002, Their Satanic Majesties Request was reissued in a new remastered CD, LP and DSD by ABKCO Records. In May 2011, the album was reissued on SHM-SACD. In 2017, a set containing two LPs (mono/stereo) as well as two SACDs (mono/stereo) was released. For the first time since the 2006 Japanese SACD release, the original 3D cover was recreated. In 2018, the album was reissued as part of the Record Store Day. The release contained a remastered stereo version of the album pressed on transparent colored vinyl (180g) and also featured the 3D-style sleeve. Without a doubt, no Rolling Stones album – and, indeed, very few rock albums from any era – split critical opinion as much as the Rolling Stones' psychedelic outing. Many dismiss the record as sub-Sgt. Pepper posturing; others confess, if only in private, to a fascination with the album's inventive arrangements, which incorporated some African rhythms, Mellotrons, and full orchestration. What's clear is that never before or after did the Stones take so many chances in the studio…In 1968, the Stones would go back to the basics, and never wander down these paths again, making this all the more of a fascinating anomaly in the group's discography. Their Satanic Majesties Request's opening song "Sing This All Together" was featured in the stage and television productions of Paul Sills' Story Theatre (1970–71), in particular appearing as the TV version's theme song. Todd Tamanend Clark released a proto-cyberpunk version of "2000 Light Years From Home" in 1975. Punk/Goth pioneers The Damned covered "Citadel" on their 1981 Friday 13th (EP). California's Redd Kross also covered "Citadel" on their 1984 Teen Babes from Monsanto EP. Cibo Matto covered "Sing This All Together" on their album Super Relax (1997). The Ohio punk band Sister Ray included "Citadel" in many of their live sets. Sheffield new wave band The Comsat Angels also covered "Citadel" for BBC (Time Considered as a Helix of Precious Stones) and Dutch (Unravelled) radio sessions, and released it as a bonus 12" to "I'm Falling", and on their fifth album, 7 Day Weekend. The Yugoslav band Električni Orgazam covered the song "Citadel" in 1983 on their cover album Les Chansones Populaires. American neo-psychedelic band The Brian Jonestown Massacre paid tribute to the album with their fourth album Their Satanic Majesties' Second Request. "2000 Man" was covered by KISS on their 1979 album Dynasty featuring lead guitarist Ace Frehley on lead vocals. Ace also used the song as the "icebreaker" when the original lineup performed on KISS Unplugged (1996). "2000 Man" was featured prominently in Wes Anderson's 1996 debut Bottle Rocket. "She's a Rainbow" is featured at the end of the third episode of the eighth season of American Horror Story. Monster Magnet included a cover of "2000 Light Years from Home" on their 2007 album 4-Way Diablo. All tracks written by Mick Jagger and Keith Richards, except "In Another Land" by Bill Wyman. ^ Popkin, Helen A.S. "The Stones may be old, but they can still rock". Today. Retrieved 6 March 2017. ^ Lester, Paul (10 July 2007). "These albums need to go to rehab". guardian.co.uk. London: Guardian News and Media Limited. Retrieved 21 July 2013. ^ Martin, Bill (1998). Listening to the Future: The Time of Progressive Rock, 1968-1978. Open Court Publishing. ISBN 9780812693683. ^ a b c d DeRogatis, Jim (2003). Turn On Your Mind: Four Decades of Great Psychedelic Rock. Milwaukee: Hal Leonard Corporation. pp. 55–60. ISBN 0-634-05548-8. ^ a b Gilliland, John. "Show 46: Sergeant Pepper at the Summit – The very best of a very good year (part 2, segment 5)". Pop Chronicles. Pasadena, CA. KRLA. via the Digital Library of the University of North Texas. Retrieved 2012-08-23. ^ Landau, Jon. "Their Satanic Majesty's Request [1968 Review]". Rolling Stone. Rolling Stone. Retrieved 19 August 2014. ^ duBrowa, Corey. "SOUND CHECK: BEATLES VS. STONES". magnetmagazine.com. Magnet Magazine. Retrieved 19 August 2014. ^ "The Beatles Photos Hidden On The Rolling Stones "Their Satanic Majesties Request" Album Cover". Feel Numb. Feel Numb. ^ Wenner, Jann S.; Wenner, Jann S. (14 December 1995). "Mick Jagger Remembers". Rolling Stone. Retrieved 19 March 2019. ^ Dodd, Philip (2003). According to The Rolling Stones. Italy: Chronicle Books. pp. 113–114. ISBN 0-8118-4060-3. ^ Jones, Brian (January 1968). "Show 46: Sergeant Pepper at the Summit – The very best of a very good year (part 2, segment 5)". Pop Chronicles. Pasadena, CA: Digital Library of the University of North Texas. KRLA. Retrieved 23 August 2012. ^ St Michael, Mick (1994). Keith Richards – In His Own Words. Omnibus Press. p. 27. ISBN 0-7119-3634-X. ^ London Records, catalog no. NPS-2. ^ Sandbrook, Dominic (4 June 2006). "The very image of the sixties". The Daily Telegraph. London. ^ Larkin, Colin (2011). The Encyclopedia of Popular Music. London: Omnibus Press. p. 2005. ISBN 978-0-85712-595-8. ^ Browne, David (20 September 2002). "Satisfaction?". Entertainment Weekly. Retrieved 30 November 2018. ^ Strong, Martin (2004). The Great Rock Discography. Canongate. p. 993. ISBN 978-1841956152. ^ "The Rolling Stones – Their Satanic Majesties Request CD Album". Muze. Retrieved 17 March 2017. ^ a b "Their Satanic Majesties Request review". Pitchfork. Retrieved 23 September 2017. ^ "Album Guide: The Rolling Stones". rollingstone.com. Archived from the original on 12 April 2011. Retrieved 17 March 2017. ^ a b Christgau, Robert (20 December 1976). "Christgau's Consumer Guide to 1967". The Village Voice. New York. p. 70. Retrieved 25 December 2013. ^ Gallucci, Michael (8 December 2015). "The Time the Rolling Stones Went Technicolor With 'Their Satanic Majesties Request'". Ultimate Classic Rock. Retrieved 2 February 2017. ^ Landau, Jon (10 February 1968). "New LP Put Stones' Status in Jeopardy". Rolling Stone (5). ^ Corliss, Richard (28 April 1968). "The Stones: Heady Promises". The New York Times. New York, NY. pp. D29. ^ Wenner, Jann (2000). Lennon Remembers. Rolling Stone Press. p. 67. ISBN 1-85984-376-X. ^ "The Stones are Rolling". eil.com. Retrieved 16 November 2007. ^ Walsh, Christopher (24 August 2002). "Super audio CDs: The Rolling Stones Remastered". Billboard. Billboard. p. 27. ^ "Rolling Stones Announce 50th-Anniversary 'Their Satanic Majesties Request' Box Set". uDiscoverMusic. Retrieved 2 May 2018. ^ "RECORD STORE DAY 2018 > The Rolling Stones - Their Satanic Majesties Request". Record Store Day. Retrieved 2 May 2018. ^ Unterberger, Richie. Their Satanic Majesties Request at AllMusic. Retrieved 19 November 2007. ^ Margotin, Philippe; Guesdon, Jean-Michel (25 October 2016). Rolling Stones All the Songs: The Story Behind Every Track. Hachette Books. pp. 203–237. ISBN 978-0-316-31773-3. ^ Everyhit.com Type "Rolling Stones" under "Name of Artist"
^ "InfoDisc : Tous les Albums classés par Artiste > Choisir Un Artiste Dans la Liste" (in French). infodisc.fr. Archived from the original on 26 January 2016. Note: user must select 'The Rolling Stones' from drop-down.